When Marty Baron took over as editor of The Boston Globe in 2001, he decided to turn his attention to a story that the paper had previously covered, but only fleetingly. One brief column piece had referred to allegations of child abuse by a Catholic priest, and the subsequent inaction of his superiors. Perhaps partially motivated by a desire to make an impact in his new position, but certainly sensing there was more to the story, he asks the Spotlight team to drop their current project and enquire further. Still active today, The Globe’s special investigation unit seeks out the hidden stories, culminating in groundbreaking, often controversial exclusives. Bound by its remit as a local paper serving the people of Boston, such scoops are not always in ready supply. Not Baron, not anyone, could have foretold the extent of what they were on the verge of uncovering here. Director and co-writer Tom McCarthy turns his cinematic torch beam onto the reporters who lifted the lid on the scandal that shamed the entire Catholic Church. Arguably, the biggest abuse scandal to have shocked the world. The script, the plotting and the acting are all fully illuminating. There are no weak links in this fabulous ensemble play. Liev Schreiber is the sober, measured editor guided by instinct, while Michael Keaton shines as the leader who must ultimately face the most searching question of all. Rachel McAdams’ turn as the tenacious field reporter reflects the struggle to maintain objective composure in the face of sickening revelations. And Mark Ruffalo sparkles as the enthusiastic hack motivated by pure moral altruism, his best moment when his emotion overwhelms him. 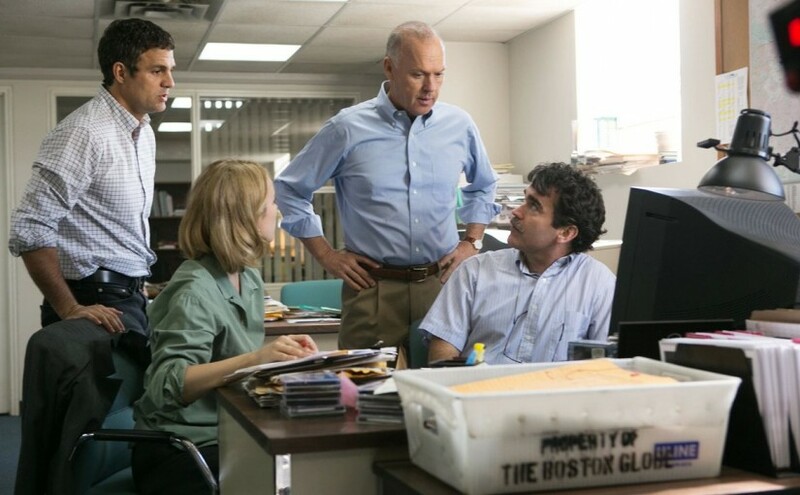 Spotlight’s key strength is that it deals with the case without sensationalism. It treats it as a thoroughly engaging human drama, experienced through the domestic lives of the journalists at its heart. The disjunct between the scale of the eventual fallout and the size of the team that lit the fuse is simply staggering. This is All The President’s Men (1976) for the digital age. The era of transparency. The era that the free expression of the Internet, then WikiLeaks, and later Snowdon ushered in. The only news capable of overshadowing the investigation is the 9/11 attack, which, for a time, waylays the paper’s fact-finding work. The downing of the twin towers highlights both the historical and the cultural context in which the revelations are unravelling. Pointedly, the Internet is referred to only once, in passing, a burgeoning medium. Its potential is just dawning. The film’s release cements a sense that the final impact of the scandal can only be properly assessed now, with hindsight. And with that perspective we see that the breaking of the story is a milestone on the path to the open information age we now live in. Spotlight is a near perfect example of a gripping, fundamental factual drama. And an exalting tribute to the expurgating power of a democratic free press. It holds you utterly in its spell, absorbed in the extrapolating web of allegations, equally appalled at the creeping resistance that grows to mirror it. It’s hard to find words to reflect the magnitude of the abhorrence of such violations of innocence. McCarthy’s film, by unfussily depicting the details of their disclosure, is as hard-hitting as any written account could be. This was the most major betrayal of society’s trust by an institution whose very purpose should be to care for and protect it. How these horrific crimes were extricated into the harsh exposure of daylight has itself been revealed. An essential, enlightening beacon of cinema.